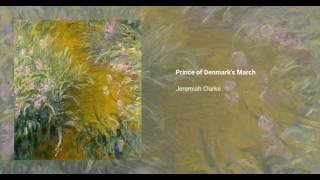 The Prince of Denmark's March (Prins Jørgens March), Trumpet Voluntary is a piece written around the year 1700 by Jeremiah Clarke, though often misattributed to Henry Purcell. The piece has become popular under the arragements of Dr. William Spark (organ) and Sir Henry Wood (trumpet, string orchestra, organ). According to some sources, the piece was written in honour of Prince George of Denmark, husband of Queen Anne of Great Britain.